Orly has released a fabulous nail color line for Fall with the Once Upon a Time collection. It’s a little bit sparkly and a little bit creamy, but every color is a gem. The stand out shade is a pine green crème called Enchanted Forest. Oh yes, I am going to go there… This is what people who missed out on Nars Zulu have been waiting for in terms of nail color. It’s a delightfully decadent color that is perfect for Fall. I took pictures of it in the sun, shade, and indoors so you can see how it stays green no matter what the lighting conditions are. It reminds me of a British racing green sports car, a leafy spinach salad, and a Christmas tree all in one—just a few of my favorite things. I’m smitten with Enchanted Forest. And I haven’t even told you the best part, it provides full, rich color in 2 coats. I know some aren’t so enamored with the jelly finish of Zulu, and for those who see jellies as streaky the Enchanted Forest will better meet your needs. Honorable mention goes to Pixie Dust and Happily Ever After. Pixie Dust is a bluish gray with platinum sparkles. Happily Ever After is a fresh berry color that appears to be a crème, but has trace amounts of sparkly goodness upon closer inspection. Orly retails for $7.50 and is available at some salons and CVS stores and is discounted at Sally’s Beauty Supply and online discounters like head2toebeauty.com. I bought mine at Sally’s and they each came with a little rhinestone zipper pull/charm on the lid. And here is some gratuitous puppy p0rn for you. I can’t have my neighbors thinking I am some kind of weirdo walking my dog and taking picture of my hand in the sun, so I also took some pictures of Chloe. 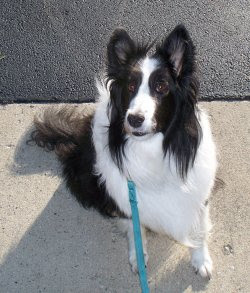 Fans of the Britcom Absolutely Fabulous will know what I mean when I say this bi-colored beauty is the Chanel of dogs. I think Edina would refer to her as the "LaCroix" of doggies...and Pats would raise her Stoli in agreement. Cheers Darling! I love anything green and Enchanted Forest is gorgeous. I've never used Orly nail polishes but I will now. 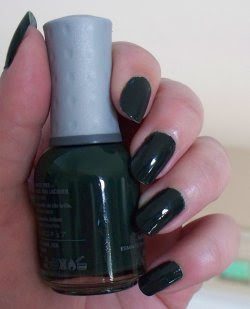 This color reminds me of a color from OPI for Sephora Fall collection called Dark Room. So dark, so enchanting and so fab! that color green used to be my favorite color when i was younger but i've never been brave enough to wear it on my nails. i'm going to have to try it out because i've been seeing that nail color all over the place in all the mags and beauty stores. it looks beautiful on you! and thanks for the extra doggie pic... ;) too cute! That color is a WOW. Need to run to Sallys . After all we got to see Chloe...a lovely dog.And your fingers look dark and is sure to make an impression in here. I've yet to try green nail polish...but that's about to change!